Artillery: Old Relic or Still Viable? Oh dear lord do I STILL have this thing? 1) Lack Of Units: There are currently three Artillery units in the game; Big Guns, Support Weapons and the Thunderfire Cannon. This makes them by far the smallest unit type in all 40k-dom, and yet they get equal space in the rulebook with Beasts, who are rather well represented in Chaos, Dark Eldar and even Guard (who had the good sense to mount their artillery on proper vehicles). 2) They're not as tough as Infantry OR Vehicles: Artillery seems to inherit the negative charactertistics from both its parents. Yes it can get a good Cover Save but unless you're Orks and therefore can get extra crew, your unit size is so small you can't help but be wiped out easily. And no crew means no gun. On the Vehicle side, the gun goes beyond the impossible and actually manages to be more fragile than the paper boats the Dark Eldar sally forth in. Even with a 4+ Obscured save the fact that a glancing hit from a bolter kills it without even a damage table makes them the worst vehicles in the game, ever. 3) Misc: These are minor points. Artillery uses Heavy Support. This means they are competing with proper, resilent vehiciles and will always be overlooked. Artillery can be quite expensive, yet easy to kill. The Thunderfire Cannon is 100 points. For slightly less I can have a Dakka Pred, which has good front armour and kills infantry reasonably well. 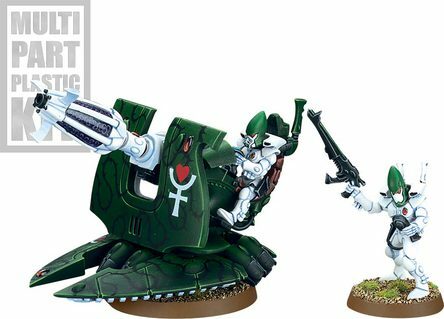 Look at the Eldar Support Weapon. It, and the Guardian Heavy Weapons for that matter, reminds me for some reason of the hovertank from Space Invaders. The Support Weapon is SCREAMING "I want to be a vehicle!" It should get its wish and become a real tank. So, how could Artillery be made better? There are two routes it could use. If it could be used as a detachment for Troops units, (non-scoring) Platoon style it might see more use. I'd probably also reduce the cost of the Thunderfire and of D and Vibro Cannons by a bit as well. This would give them a more justified place and allow the current rules to be kept.They may be too fragile for Heavy Support, but they are slightly better than IG weapons teams, so are just right as a Troops detachment. The other alternative is to make them a new class of Vehicle proper. They could be made cheaper and allowed an AV of less than ten. The current crew/gun divide could be swapped, so if damage is cause on a 5+ it hits the crew. Another table could be used for them (1-2 shaken, 3-5 stunned, 6-crewman killed) with the gun taken out of action if all the crew die or the weapon is ripped off (with the gun using the standard table). They could probably stay Heavy Support or still be moved to Troops in this case, and they would certainly be more viable in smaller games. So that's me on Artillery, an old concept that won't go away. Next time I write here, I'll ask whether or not it is possible to design a truly unique Troops choice. See you then. Artillery NEEDS a rework. Or a removal. You mean the Kreig list? Yeah, one of my friends uses it. I've gotta say, the Artillery rules are a major liability for him. Snikrot murders them so hard it's not even funny. All original images and writing are © Master Bryss 2012-17. Hands off 9gag. No challenges intended. Player 3 Has Entered The Game! But Is This Wise?